Amazon || Buy a print copy! With the Summer season finally at it’s full blast here in Manila, it’s a no-brainer for bibliophiles such as myself to be on the constant lookout for books about the blinding heat, and/or relaxing beaches. Just as I did when I read Let It Snow and My True Love Gave To Me during my winter vacation. 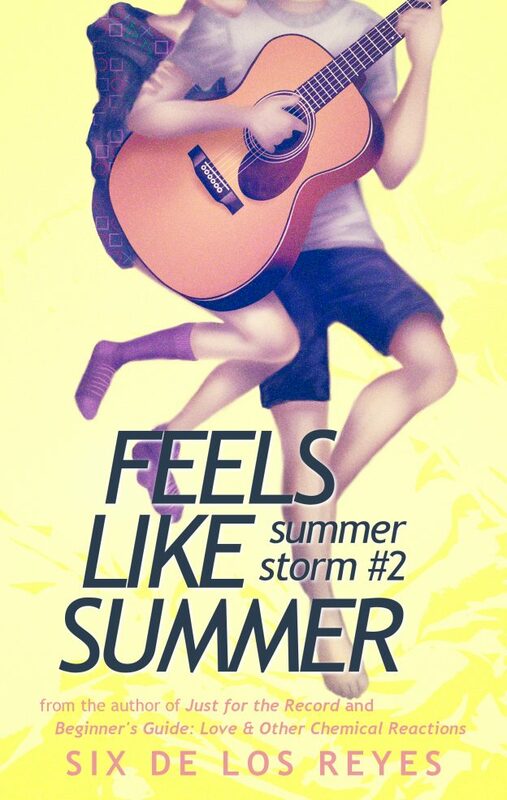 Today, as the scorching heat further melts my skin, I’m here to talk about my rather incoherent thoughts on Feels Like Summer by Six De Los Reyes. I’m not gonna lie, I went in blind when I signed up for this tour. Right after I read Beginner’s Guide: Love and Other Chemical Reactions, I was pretty confident about liking, if not loving, Six’ other books. I believe it’s safe to say that I did love Feels Like Summer. As with her previous book, Six wrote such an endearing story with new characters that will surely tug on everyone’s heartstrings. Oh, and did I mention that this happens to be a fast-paced read too? As with all #romanceclass books, expect to be done with this book within a day or two. Every page will surely captivate readers, leaving them breathless, and wanting more. On a slightly negative note, however, I did have quite a hard time trying to keep up with some of the names, and small back stories of a couple of side characters, who apparently were mentioned in Feels Like Summer with a cameo role. I mean, I don’t mind reading about authors’ previous characters in a different novel. Sometimes, I even get excited whenever I see familiar names in a book, but I guess what I’m trying to say is that I might have enjoyed reading this book if I was forewarned that some of the characters appeared in the author’s past books. Never read a #romanceclass book before but Six De Los Reyes has always been at the top of my author list to check out. Maybe I’ll start with this one since I LOVEEE anything music related. And it looks like the perfect summer read too hihi.